Easily grown in abundantly moist, fertile, humusy soils in full sun to part shade. Also performs well in moist sandy to gravely soils. Soils must not be allowed to dry out. Generally intolerant of shady locations. 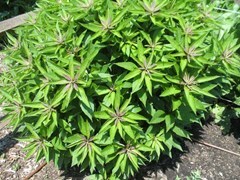 Plants may be cut to the ground in late winter. Species plants will spread in the landscape by self-seeding. ‘Baby Joe’ is a patented plant that will not come true from seed. Eutrochium dubium, commonly known as coastal plain Joe Pye weed, is a coarse, herbaceous perennial that typically grows to 3-5’ tall and to 2-4’ wide on purple-spotted stems clad with ovate, coarsely-toothed, strongly three-veined leaves (to 6” long) arranged in whorls of 3-4. This is a wetland species which is native primarily to sandy swamps, riverbanks and moist thickets in Eastern North America from Nova Scotia and Maine south along the coastal plain to South Carolina and Alabama. Small disk flowers (rays absent) ranging in color from pale pink to dark purple bloom in corymbiform, dome-shaped clusters (4-7” across) from July to September. This plant has been moved from the genus Eupatorium to the genus Eutrochium. Eupatorium dubium is a synonym. Genus name is derived from the Greek words eu meaning well and troche meaning wheel-like in reference to the whorled leaves. Specific epithet from Latin means doubtful. Joe Pye was reportedly an Indian herbalist and healer from the New England area. ‘Baby Joe’ is a more compact cultivar than the species, typically growing in a clump to 2-3’ tall and to 1-2’ wide. Patent information states that it is the result of a cross-pollination of two unnamed selections of Eupatorium purpureum (now attributed to Eutrochium dubium) which was discovered as a single flowering plant grown in a controlled greenhouse environment in Rijpwetering, The Netherlands in September of 2003. U.S. Plant Patent PP20,320 was issued September 15, 2009. The unique characteristics of ‘Baby Joe’ as set out in the plant patent documents are: (1) upright and relatively compact plant habit, (2) moderately vigorous growth habit, (3) freely flowering habit, (4) large grayed purple-colored inflorescences and (5) strong and upright peduncles. No serious insect or disease problems. Good resistance to powdery mildew. Leaves may scorch if soils are allowed to dry out. Moist areas in borders, cottage gardens, meadows, native plant gardens, wild/naturalized areas, rain gardens or water margins.